WASHINGTON—Reminding herself that “old habits die hard” before letting the 6-year-old out of her trunk, Kirstjen Nielsen admitted Monday that she momentarily forgot she was a private citizen after instinctively detaining a Mexican child on the street. “Oh, Kirstjen, you silly goose—you don’t have the authority to ask people for their papers anymore, let alone arrest them!” said the former secretary of the Department of Homeland Security as she helped the terrified young boy out of her car, unlocked his handcuffs, and admonished herself for letting work creep in just one day after she resigned from the government. “As much as you want it to be, enforcing the family separation policy just isn’t your job anymore. So the next time you see a Mexican family in a parking lot, don’t immediately wrestle the mother to the ground, spit on her face, and tell her that she’ll never see her dirty son again. 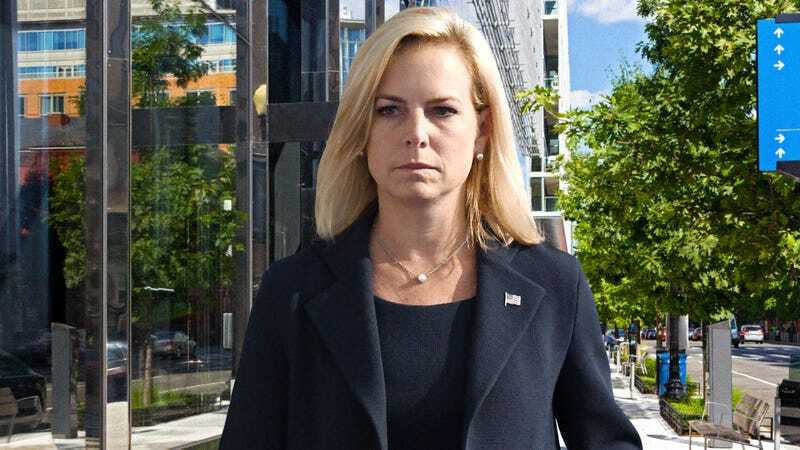 That’s someone else’s battle now.” At press time, Nielsen took several deep breaths, told herself it was time to move on, and immediately called ICE on the boy and his family.